მიშელ ფრანსუა პლატინი (ფრანგ. Michel François Platini; დ. 21 ივნისი 1955, ჟეფი, ლოთარინგია, საფრანგეთი) — ფრანგი ფეხბურთელი, ნახევარმცველი. სხვადასხვა დროს იცავდა „ნანსის“, „სენტ-ეტიენის“, „იუვენტუსისა“ და საფრანგეთის ეროვნული ნაკრების ღირსებას. საფრანგეთის თასის მფლობელი (1978) „ნანსის“ შემადგენლობაში. საფრანგეთის ჩემპიონი (1981) და საფრანგეთის თასის ორგზის ფინალისტი (1981, 1982) „სენტ-ეტიენის“ შემადგენლობაში. იტალიის ორგზის ჩემპიონი (1984, 1986) და იტალიის თასის მფლობელი (1983), თასების მფლობელთა თასისა (1984) და უეფა-ს სუპერთასის მფლობელი (1984), ევროპის ჩემპიონთა თასის მფლობელი (1985), ფინალისტი (1983) და საკონტინენტთაშორისო თასის მფლობელი (1985) „იუვენტუსის“ შემადგენლობაში. 1984 წლის ევროპის ჩემპიონი და 1986 წლის მექსიკის მსოფლიო ჩემპიონატის ბრინჯაოს პრიზიორი საფრანგეთის ეროვნული ნაკრების შემადგენლობაში. 1978 წლის არგენტინის მსოფლიო ჩემპიონატისა და 1982 წლის ესპანეთის მსოფლიო ჩემპიონატის მონაწილე. მსოფლიოს ერთ-ერთი უდიდესი ფეხბურთელი სპორტის ამ სახეობის არსებობის ისტორიაში. როგორც ევროპის საუკეთესო მოთამაშე სამჯერ გახდა ოქროს ბურთის მფლობელი (1983, 1984, 1985). საფრანგეთის ფეხბურთის ისტორიაში იგი ერთადერთია ვინც სამჯერ შეძლო ამ საპატიო ტიტულისა და პრიზის მოპოვება. France Football-ის მიერ ჩატარებული გამოკითხვის შედეგად მიშელ პლატინი საფრანგეთის ასწლეულის ფეხბურთელად დასახელდა. მარადონას შემდეგ პლატინი ყოველთვის ითვლებოდა 80-იანი წლების ერთ-ერთ საუკეთესო ფეხბურთელად. მისი პირველი კლუბი იყო ნანსი. ნანსიში კარგი თამაშის შემდეგ გადავიდა სენტ ეტიენში სადაც მოიპოვა საფრანგეთის ჩემპიონის ტიტული, შემდეგ შეამჩნია იტალიურმა კლუბმა იუვენტუსმა და გადაიბირა. პლატინიმ თავი გამოიჩინა ტექნიკითა და ჯარიმის შესრულებით. ის იყო საფრანგეთის ეროვნული ნაკრების კაპიტანი. მისი დამსახურებით საფრანგეთი გახდა ევროპის ჩემპიონი 1984 წელს, სადაც 5 თამაშში გაიტანა 9 გოლი. 1976–1987 წლებში საფრანგეთის ეროვნული საფეხბურთო ნაკრების შემადგენლობაში 72 მატჩი ითამაშა და 41 გოლი გაიტანა. პლატინიმ მსოფლიო ჩემპიონატების 14 შეხვედრაში მიიღო მონაწილეობა და 5 გოლი გაიტანა. კაკაბაძე, მიხეილ (1979). არგენტინის ცის ქვეშ. თბ. : საქ. კპ ცკ-ის გამ-ბა. კაკაბაძე, მიხეილ (1981). ოქროს ქალღმერთიდან ფიფა-ს თასამდე. თბ. : საქ. კპ ცკ-ის გამ-ბა. ფანჯიკიძე, გურამ (1979). არგენტინა, არგენტინა!. თბ. : გამ-ბა საბჭ. საქართველო. ფანჯიკიძე, გურამ (1982). ფორცა, იტალია!. თბ. : გამ-ბა საბჭ. საქართველო. ფანჯიკიძე, გურამ (1987). მარადონა რეი : მსოფლიოს XIII ჩემპიონატის შთაბეჭდილებები. თბ. : ნაკადული. გოდუაძე, ლაშა (2010). მსოფლიო თასის ისტორია (1930–2010). თბ. : გაზეთი „მსოფლიო სპორტი“. Tournon, Philippe (1977). Platini, le football en fête. Paris: Alta Sport. შეგიძლიათ იხილოთ მედიაფაილები თემაზე „მიშელ პლატინი“ ვიკისაწყობში. ↑ FIFA (17 ნოემბერი, 2014). Elegance and intelligence personified in blue. He never did win the FIFA World Cup™, the ultimate prize for a footballer. In fact, it is the only trophy missing from Platini's impressive trophy cabinet, but that surely does not detract from his status as a footballing legend. His technical ability, reading of the game and amazing ruthlessness in front of goal made him one of the game's all-time greats. FIFA.com. წაკითხვის თარიღი: 21 ივლისი, 2018. ↑ Erik Garin and José Luis Pierrend (18 იანვარი, 2018). French Player of the Century. ფრანგული ყოველკვირეული სპორტული ჟურნალის France Football-ის ინიციატივით ჩატარდა გამოკითხვა, რომელშიც მონაწილეობა მიიღო 1958–1999 წლების პერიოდში საფრანგეთის წლის საუკეთესო მოთამაშედ აღიარებულმა ყველა ფეხბურთელმა. მათ უნდა დაესახელებინათ ასწლეულის ფრანგი ფეხბურთელი, ასწლეულის ფრანგი მწვრთნელი და ასწლეულის ფრანგული გუნდი. გამოკითხვის შედეგად ასწლეულის ფეხბურთელად მიშელ პლატინი დასახელდა, მეორეზე ზინედინ ზიდანი გავიდა, ხოლო მესამეზე — რაიმონ კოპა. გამოკითხული 34 ფეხბურთელიდან 22-მა — ასწლეულის ფეხბურთელად პლატინი დაასახელა, ცხრამ — ზიდანი, ხოლო სამმა — კოპა. Rec.Sport.Soccer Statistics Foundation. RSSSF. წაკითხვის თარიღი: 21 ივლისი, 2018. ↑ FIFA. მსოფლიო საფეხბურთო ჩემპიონატი 1978. მატჩები; გუნდები; სტატისტიკა. FIFA.com. წაკითხვის თარიღი: 21 ივლისი, 2018. ↑ FIFA. მსოფლიო საფეხბურთო ჩემპიონატი 1982. მატჩები; გუნდები; სტატისტიკა. FIFA.com. წაკითხვის თარიღი: 21 ივლისი, 2018. ↑ FIFA. მსოფლიო საფეხბურთო ჩემპიონატი 1986. მატჩები; გუნდები; სტატისტიკა. FIFA.com. წაკითხვის თარიღი: 21 ივლისი, 2018. ↑ Player Profile for Michel Platini in the Soccer World Cups. Michel Platini in the World Cups. Information about Michel Platini and his performace in the FIFA Soccer World Cup. Profile with general and detailed stats and data that include National Team, total games, goals and cards and full list of matches played. The Soccer World Cups.com. წაკითხვის თარიღი: 12 იანვარი, 2019. 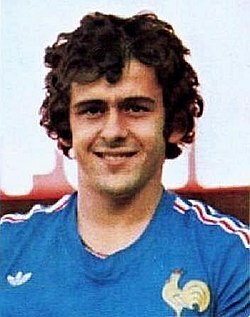 ↑ Michel Platini (AS Nancy Lorraine) Coupe de France 1977–78. Coupe de France: Vainqueur (1): 1977/78 (AS Nancy Lorraine). pari-et-gagne.com. წაკითხვის თარიღი: 22 ივლისი, 2018. ↑ Michel Platini (AS Saint-Etienne) 1980–81. Championnat de Ligue 1 / Division 1: Champion (1): 1980/81 (AS Saint-Etienne). pari-et-gagne.com. წაკითხვის თარიღი: 22 ივლისი, 2018. ↑ Michel Platini (AS Saint-Etienne) 1981–82. Championnat de Ligue 1 / Division 1: Vice-champion (1): 1981/82 (AS Saint-Etienne). pari-et-gagne.com. წაკითხვის თარიღი: 22 ივლისი, 2018. ↑ Michel Platini (AS Saint-Etienne) Coupe de France 1981, 1982. Coupe de France: Finaliste (2): 1980/81, 1981/82 (AS Saint-Etienne). pari-et-gagne.com. წაკითხვის თარიღი: 22 ივლისი, 2018. ↑ Michel Platini (Juventus Turin) 1984, 1986. Championnat d'Italie de Serie A / Division 1: Champion (2): 1983/84, 1985/86 (Juventus Turin). pari-et-gagne.com. წაკითხვის თარიღი: 22 ივლისი, 2018. ↑ Michel Platini (Juventus Turin) 1983, 1987. Championnat d'Italie de Serie A / Division 1: Vice-champion (2): 1982/83, 1986/87 (Juventus Turin). pari-et-gagne.com. წაკითხვის თარიღი: 22 ივლისი, 2018. ↑ Shemilt, Stephan. (12 მაისი, 2012) BBC Sport – Euro 1984: Euro 1984: Michel Platini at his peak inspires France. BBC.co.uk. წაკითხვის თარიღი: 24 ივლისი, 2018. ↑ “BBC SPORT | Football | Euro 2004 | History | France 1984“, BBC News, 17 მაისი, 2004. წაკითხვის თარიღი: 24 ივლისი, 2018. ↑ “EURO 1984 team of the tournament“, Union of European Football Associations. წაკითხვის თარიღი: 24 ივლისი, 2018. ↑ “Platini fires France to glory on home soil“, UEFA. წაკითხვის თარიღი: 24 ივლისი, 2018. ↑ 1984 UEFA European Championship. Union of European Football Associations. წაკითხვის თარიღი: 24 ივლისი, 2018. ↑ European Football Championship 1984. UEFA (11 მაისი, 2000). წაკითხვის თარიღი: 24 ივლისი, 2018. ↑ Erik Garin and José Luis Pierrend (18 იანვარი, 2018). France – Footballer of the Year. Elected by the magazine France-Football. The award is for the calendar year and not for the season. Apparently since some year in the 90’s any French player is eligible no matter where he plays. Rec.Sport.Soccer Statistics Foundation. RSSSF. წაკითხვის თარიღი: 21 ივლისი, 2018. ↑ Rob Moore and Karel Stokkermans (14 დეკემბერი, 2017). European Footballer of the Year ("Ballon d'Or"). Since 1956 the bi-weekly (formerly weekly) French magazine France Football awards the "Ballon d'Or" for the best European Footballer of the calendar year. Only players from European clubs are eligible. Until 1994 any player from an European National Team was eligible; since 1995 any player from a European club (regardless of his nationality) is eligible but he must also be part of a preliminary list of 50 players established by France Football. Rec.Sport.Soccer Statistics Foundation. RSSSF. წაკითხვის თარიღი: 21 ივლისი, 2018. ↑ José Luis Pierrend (1 მაისი, 2005). European Footballer of the Year ("Ballon d'Or") 1977. The results of this voting were published on France Football # 1655 (27 December 1977). There were 25 voters, from Austria, Belgium, Bulgaria, Czechoslovakia, Denmark, East Germany, England, Finland, France, Greece, Hungary, Italy, Luxembourg, the Netherlands, Norway, Poland, Portugal, Republic of Ireland, Romania, Soviet Union, Spain, Sweden, Switzerland, Turkey, West Germany and Yugoslavia. 1. Allan Simonsen (Denmark, Borussia M’Gladbach). Total Number of Points – 74; 2. Kevin Keegan (England, Hamburger SV). Total Number of Points – 71; 3. Michel Platini (France, AS Nancy). Total Number of Points – 70. Rec.Sport.Soccer Statistics Foundation. RSSSF. წაკითხვის თარიღი: 21 ივლისი, 2018. ↑ José Luis Pierrend (14 დეკემბერი, 2017). "Onze Mondial" Awards (Onze d'Or 1977). Since 1976, the French magazine "Onze Mondial" (originally Onze, changed name 1989) hands out awards at the end of the year. The readers select the "Onze de Onze" (an ideal team of the season) and among those players they choose the top-3 receiving, respectively, the Onze d'Or, Onze d'Argent and Onze de Bronze. Any player in a European league is eligible. Onze d'Or winners 1977 – Kevin Keegan (Onze d'Or); Michel Platini (Onze d'Argent); Allan Simonsen (Onze de Bronze). Rec.Sport.Soccer Statistics Foundation. RSSSF. წაკითხვის თარიღი: 21 ივლისი, 2018. ↑ Володимир Баняс (25 აგვისტო, 2015). Найкращий футболісти Європи по сезонах. Футболіст № 1 сезону: опитування МОК. 1983/84 – М. Платіні (Франція; «Ювентус»); А. Жиресс (Франція; «Бордо»); Я. Раш (Англія; «Ліверпуль»). Український футбол (2015). №60 (3026). ukrfootball.ua. წაკითხვის თარიღი: 21 ივლისი, 2018. ↑ Володимир Баняс (25 აგვისტო, 2015). Найкращий футболісти Європи по сезонах. Футболіст № 1 сезону: опитування МОК. 1984/85 – М. Платіні (Франція; «Ювентус»); П. Ельк’єр-Ларсен (Данія; «Верона»); Г. П. Брігель (ФРН; «Верона»). Український футбол (2015). №60 (3026). ukrfootball.ua. წაკითხვის თარიღი: 21 ივლისი, 2018. ↑ Erik Garin and José Luis Pierrend (18 იანვარი, 2018). French Player of the Century. 1. Michel Platini – 143 pts. ; 2. Zinédine Zidane – 121pts. ; 3. Raymond Kopa – 88pts. The French magazine France-Football consulted 34 former "French Footballer of the Year" (1963–99) or "Etoile d'Or" (1958–62) to elect the French Player of the Century, the French Trainer of the Century and the French Team of the Century. All former winners have voted except Jean-François Larios which was impossible to reach. France Football journalist Gérard Ernault has voted. Each of the 34 voters choose 5 players: 5 points for the 1st place, 4 points for 2nd, 3 points for 3rd, 2 points for 4th and 1 point for 5th. One vote with two fith places. The former winners cannot voted for themselves. After each player points, between brackets is the number of votes for every place. Rec.Sport.Soccer Statistics Foundation. RSSSF. წაკითხვის თარიღი: 21 ივლისი, 2018. ↑ Michel Platini was inducted into the English Football Hall of Fame. Platini has won the coveted Ballon d’Or three times in 1983, 1984 and 1985. He came in sixth in the FIFA Player of the Century poll. In recognition of his achievements he was named the Chevalier of the Legion of Honour in 1985 and became Officier in 1988 in France. Platini was inducted into the English Football Hall of Fame and also named as the All-time Greatest European Footballer. He was World Soccer Player of the Year in 1984 and 1985. He was also inducted into the Italian Football Hall of Fame. FamousSoccerPlayers.org. წაკითხვის თარიღი: 21 ივლისი, 2018. ↑ Vivo Azzurro (25 ოქტომბერი, 2016). Italian football Hall of Fame to induct ten new stars. Foreign players: Michel Platini (since 2011), Marco Van Basten (since 2012), Gabriel Batistuta (since 2013), Diego Armando Maradona (since 2014), Ronaldo (dal 2015), Paulo Roberto Falcão (since 2016). vivoazzurro.it. წაკითხვის თარიღი: 22 ივლისი, 2018. ↑ Roberto Di Maggio, Igor Kramarsic and Alberto Novello (1 ივნისი, 2018). Italy – Serie A Top Scorers. 1982/83 – Platini (Juventus – 16); 1983/84 – Platini (Juventus – 20); 1984/85 – Platini (Juventus – 18). Rec.Sport.Soccer Statistics Foundation. RSSSF. წაკითხვის თარიღი: 22 ივლისი, 2018.
ეს გვერდი ბოლოს დარედაქტირდა: 03:07, 12 იანვარი 2019.